The Harris No. 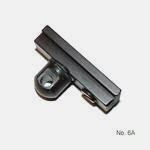 6A adapter is for American sized rails, which are about 5/16" across the rail slot. These adapters allow you to attach any Harris Bipod to your firearm with American sized Rail under the forearm.